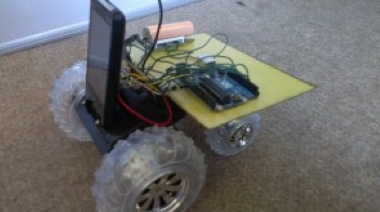 In what can only be described as an exercise in using as much technology as possible, Rohit Krishnan has devised a remote-control system for a cheap toy car that demonstrates a variety of development tools. First – the control process… a PC accepts keyboard commands which are sent via Wi-Fi to an Android phone. These commands are converted by an Android app into audio signals – sounds – that are sent from the headphone socket to the Arduino. Finally – the Arduino is programmed to decipher the audio signal into the original commands… at which point it executes them to control the car. Motor control is via a typical H-bridge IC – and can easily be replicated with an inexpensive Arduino motor shield from the usual suppliers. Over time this project could be modified to accept further commands – such as activate the camera when a certain condition is true, or send an SMS when the car cannot move out of a jam.